or create or edit your workshop description. But the most important thing to focus on should always be your content! These options allow you to incorporate paragraph spacing, bold and italic phrasing, bulleted and numbered lists, links to other websites, and images from other websites within your text. Appropriate use of these tools will help you to better relay your message or story to your fellow HomeRefurbers. After a recent bout with a dusty shop and outside temperatures too cold to open my garage door, I made the decision to try and incorporate hand planes into my woodworking. 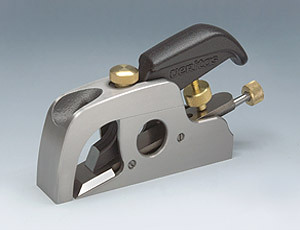 My extensive Lee Valley Wish List proved fruitful over the Christmas Holiday, and I found myself the proud owner of a Bullnose plane from Veritas Tools, Inc. Don’t let its small size fool you – this little plane is versatile and easy to use, making it an integral part of any serious blended woodworker’s toolbox. For starters, the Bullnose plane is really two planes in one. With the toe piece in place, it can be used in the capacity of its namesake (a bullnose plane); but a few turns of a brass knurled knob removes the toe piece and leaves you with a chisel plane. The design of this plane makes it comfortable to hold in either configuration. As a bullnose, this little plane excels at such tasks as cleaning up through rabbets, dados, and grooves. What about stopped rabbets, you ask? Remove that toe and there you go! The 40 degree cutting angle allows this plane to work well on end-grain, making it useful for cleaning up tenon shoulders, too! You can rest assured that all of these cuts will be true and square because of the precision milling of its sides and sole. For those of you with the need to know, the body is 4 ½” long and 1” wide, the blade is 1/8” thick and comes in either A2 or 01 tool steel, and it weighs in at just over 1 ¼ lb. So what do you think? It’s well written, I know, but it lacks visual interest. Why don’t we jazz it up a bit, shall we? Note: A word of warning about bold and italic formatting – don’t over-use them! These features should be used sparingly for emphasis. If you bold every other word or sentence, you’ll lessen the effects it can carry. It should also be noted that these are phrase modifiers, so they should be used within paragraphs (don’t try to bold an image!). And finally, I’d like the words “Veritas Tools, Inc.” to hyperlink to the Veritas website. To do this, I highlight the text and click the Link button in the formatting toolbar. This opens up a dialog box where you can enter the URL (website) information. When I click OK to close that dialog box, the text I highlighted will appear in quotes, followed by a colon, followed by the website address. This is a really big paragraph, and even if we strategically added hyperlinks and bolded and italicized text throughout, it would still be one big paragraph. In order to break it up into smaller paragraphs, you need to add a blank line wherever you want the division. To do that, place the cursor where you’d like the new paragraph to start and press the <Enter> key twice. I’m going to do that after the Veritas website hyperlink, after the sixth sentence, and after the eleventh sentence. Wouldn’t you like to know what the Veritas Bullnose plane looks like? Well, we can insert an image easily enough. I think it should go between the first two paragraphs, and since I always like to have a blank line separating my text and my imagery, I’ll add two more line returns there by placing my cursor after the first paragraph and pressing the <Enter> key two more times. Once that is done, I need to go out and grab the image location from the Veritas website. After I’ve navigated to the website and found the image, the way I copy that image will vary, depending upon the web browser I’m using. If I’m using Internet Explorer, I’ll right-click on the image, select “Properties”, highlight the image Address (URL), and copy it with <Ctrl> C or right-click Copy. If I’m using Firefox, I’ll right-click on it and select “Copy Image Location”. After I return to my text and place my cursor where I want the image to display, I’ll click on the Image button . This opens a dialog box asking me to enter the location of the image. The easiest way to do this is to right-click in the field and select “Paste”. When I click OK, another dialog box asks for a description of the image. This will add a descriptive line of text to the image that will display when you mouse over it in the final version. I’ll click OK one more time and a third dialog box opens, asking me to enter a hyperlink address if I want the image to hyperlink to a website. and it weighs in at just over 1 ¼ lb. * and it weighs in at just over 1 ¼ lb. Just for some added interest, I’m going to go in and add a few more bold and italicized words, but the process is all the same. _Don’t let its small size fool you_ - this little plane is versatile and easy to use, making it an integral part of any serious blended woodworker’s toolbox. For starters, the Bullnose plane is really _two planes in one!_ With the toe piece in place, it can be used in the capacity of its namesake (a bullnose plane); but a few turns of a brass knurled knob removes the toe piece and leaves you with a *chisel plane*. The design of this plane makes it comfortable to hold in either configuration. As a bullnose, this little plane excels at such tasks as cleaning up through rabbets, dados, and grooves. _What about stopped rabbets, you ask?_ Remove that toe and there you go! The 40 degree cutting angle allows this plane to work well on end-grain, making it useful for cleaning up tenon shoulders, too! You can rest assured that all of these cuts will be true and square because of the *precision milling* of its sides and sole. Once you have added formatting features to your text, you can always double-check your work to make sure it is set up properly by using the Preview button , which is located in the right-hand corner of the Content frame. To return to the Entry screen, click the Close Preview button , located in the same place on the Preview frame. After a recent bout with a dusty shop and outside temperatures too cold to open my garage door, I made the decision to try and incorporate hand planes into my woodworking. My extensive Lee Valley Wish List proved fruitful over the Christmas Holiday, and I found myself the proud owner of a Bullnose plane from Veritas Tools, Inc.
Don’t let its small size fool you – this little plane is versatile and easy to use, making it an integral part of any serious blended woodworker’s toolbox. For starters, the Bullnose plane is really two planes in one! With the toe piece in place, it can be used in the capacity of its namesake (a bullnose plane); but a few turns of a brass knurled knob removes the toe piece and leaves you with a chisel plane. The design of this plane makes it comfortable to hold in either configuration. As a bullnose, this little plane excels at such tasks as cleaning up through rabbets, dados, and grooves. What about stopped rabbets, you ask? Remove that toe and there you go! The 40 degree cutting angle allows this plane to work well on end-grain, making it useful for cleaning up tenon shoulders, too! You can rest assured that all of these cuts will be true and square because of the precision milling of its sides and sole. For step-by-step processes of how to perform any of the Basic Formatting, refer to the How To documentation.